Building bigger biceps is top of many men’s gym wish list. But you only need to look around the next time you’re in the gym to realize that their wishes haven’t come true. This exercise is one of the best exercise to help prevent that momentum issue from happening, since it essentially restricts the movements of the back. When doing this exercise, you will feel maximum tension on the biceps muscle belly, so don’t be surprised if the weight is slightly lower. As long as you are pushing yourself hard, using the lower weight but maintaining proper form will be the way to go for the results. Barbell Curl workout will allow you to overload those biceps with a heavy weight. 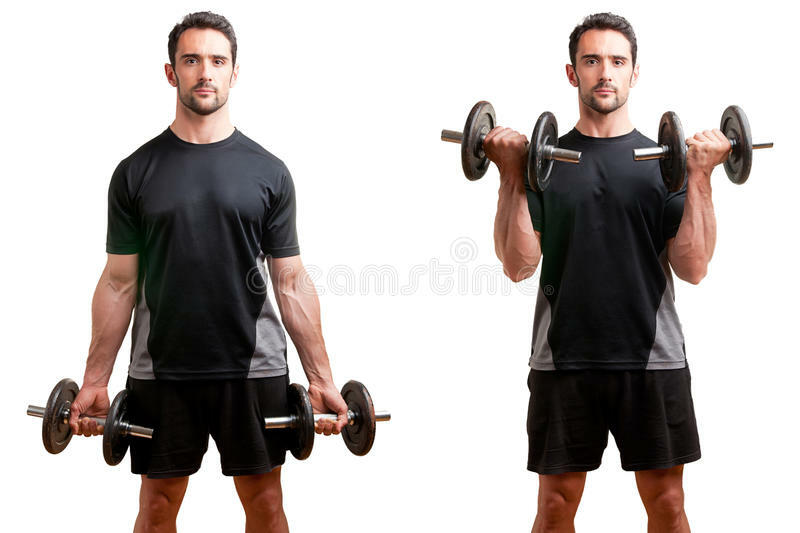 Most trainees are slightly stronger when lifting a barbell versus a set of dumbbells, so this is the great one for maximum strength development. When doing this exercise, the primary thing to focus on is that you are not cutting the movement pattern short at all, and that you aren’t allowing momentum to cause you to lean the backward as you hoist the weight upwards. This is one of the most common mistakes with this exercise—momentum performs more of the work than your muscles actually do. If you perform it in a slow and controlled manner, that should reduce the chances of this happening significantly and allow you to place a higher intensity deep within the muscle fibers. This particular curl involves a cable and your choice of attachment, from a straight or cambered bar to a rope or even a D-handle if you train one arm at a time. 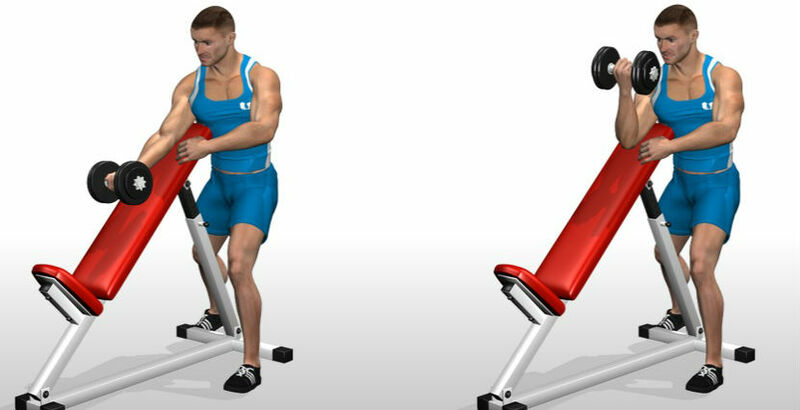 It gains a slight edge because it offers the ability to work against more total resistance and your elbows are in a mechanically stronger position at your sides. Grab a pair of dumbbells and let them hang at arm’s length next to your sides. Turn your arms so your palms face forward. Pause, then slowly lower the weight back to the starting position. Each time you return to the starting position, completely straighten your arms. 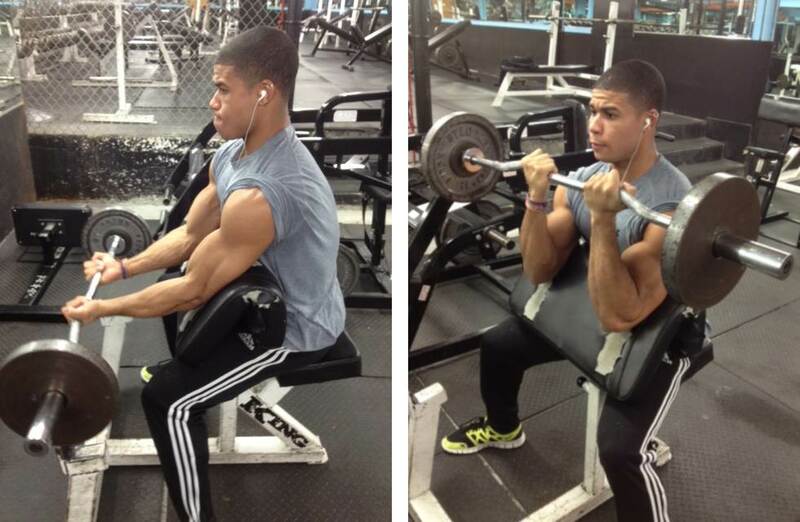 The exercises to consider to blast your biceps into growth are concentration curls. When done while sitting, these will also limit the degree momentum plays in the execution of the exercise and place all the emphasis right on the biceps muscle. There will be no helper muscles called into play when doing concentration curls (when done properly), so this is a good one to add in at the very end of your workout when you’re really looking to finish off the biceps and fully exhaust them. This biceps workout takes advantage of isometric training, a technique in which you hold the weight in one position for a period of time. It will stimulate your muscles in a way that is different from performing full reps, according to BJ Gaddour, former Men’s Health Fitness Director. And that simple change can spur new growth. 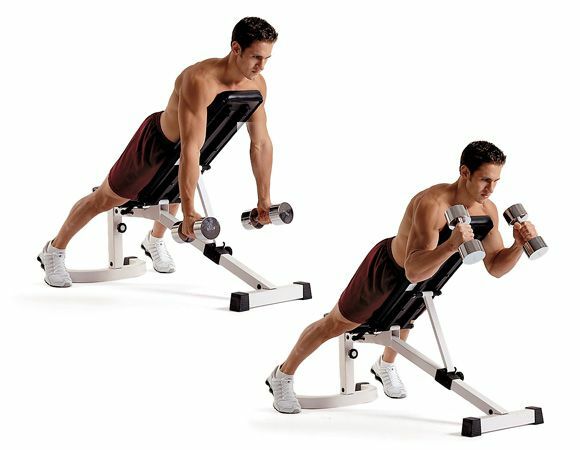 Grab a dumbbell with your right hand and stand behind a bench raised to a 45-degree angle. Hold for 20 seconds and then repeat on your left arm. Lying chest-down on a bench really isolates the biceps since you don’t have to maintain as much tension in your legs and core muscles as you do when you stand. Use various grips in this position to zero in on different parts of your biceps. Grab a pair of dumbbells and lie with your chest against a bench that’s set to a 45-degree incline. Pause, then slowly lower the weight back to the starting position. Each time you return to the starting position, completely straighten your arms. Instead of holding your arms by your sides for this variation of the biceps curl, you’ll keep them extended outwards, parallel to the floor. Just holding your arms in this position will put them to work. 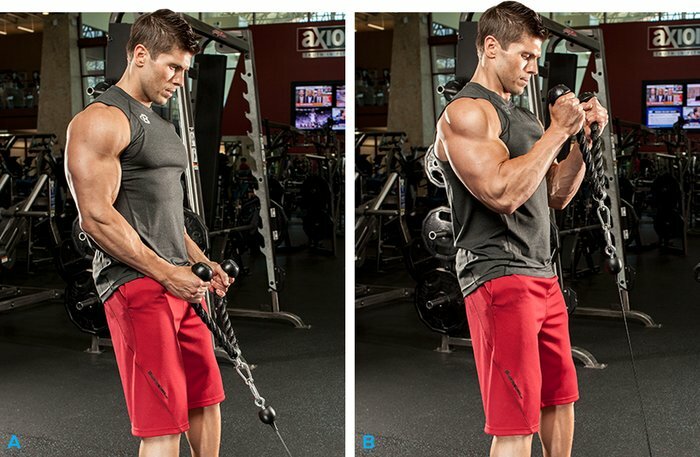 Adding a curl helps zero in directly on your biceps. Stand between the weight stacks of a cable crossover station and grab a high-pulley handle in each hand. Hold your arms out to the sides so they’re parallel to the floor. Slowly allow your left arm to straight and then repeat the move with your right arm. Resting your arms on a sloping pad of a preacher bench helps isolate your biceps by taking your other upper-body muscles out of the equation—meaning, they won’t come into play to assist where your biceps are weakest. If you don’t have the appropriate workstation, you can use a Swiss ball or a bench angled to 45 degrees. Grab an EZ-bar with your hands six inches apart. Rest your upper arms on the sloping pad of a preacher bench and hold the bar in front of you with your elbows slightly bent. 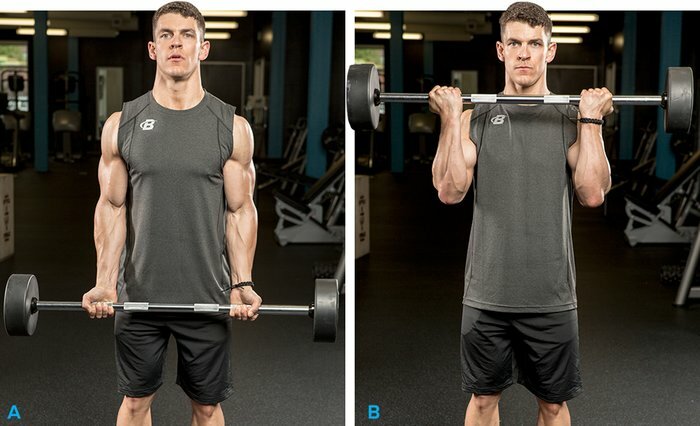 Without moving your upper arms, bend your elbows and curl the bar toward your shoulders. The hammer will typically be our strongest curl during a biceps workout. This is because all of our elbow flexors are actively involved, and the forearm and wrist are in a power position. 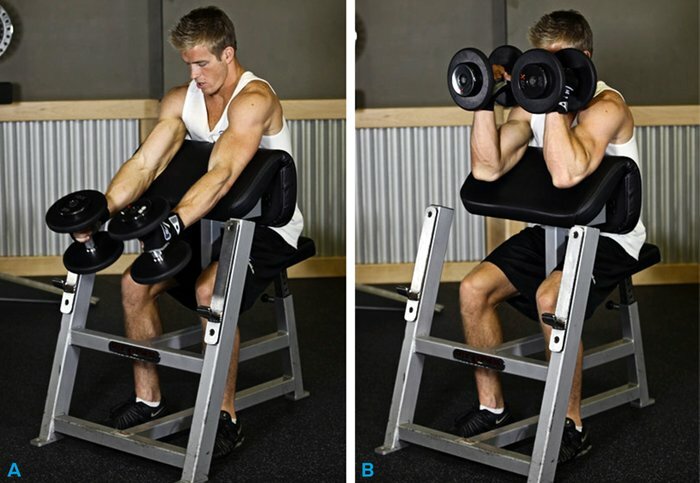 Doing this movement like a concentration curl or preacher curl (on a preacher bench) will minimize cheating and maximize muscle recruitment during the workout. Thanks Sachin. your feedback is valuable to us.